SATURDAY, Jan. 13, 2018 (HealthDay News) — Kids who have a good relationship with their grandparents are less likely to become prejudiced against old people, a new study has found. 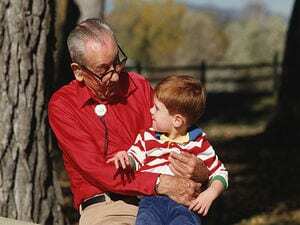 That prejudice, known as ageism, is fairly common in children, even in those as young as 3, according to researchers from the University of Liege in Belgium. However, their study found that ageism tends to dwindle at about ages 10 to 12 and that, when it comes to their grandparents, it’s the quality rather than the quantity of a relationship that makes the most difference. “The most important factor associated with ageist stereotypes was poor quality of contact with grandparents,” study leader Allison Flamion, a graduate student in psychology, said in a news release from the Society for Research in Child Development. In other words, the better the grandparent/grandchild relationship, the less likely the child was prejudiced against people based on age. The study involved surveying 1,151 kids, aged 7 to 16, who lived in the French-speaking part of Belgium. The children were mostly white and came from a variety of income backgrounds. They answered questions about subjects such as older people, getting old and how they got along with their grandparents. The researchers also gathered information about the children’s grandparents, including the state of their health. Overall, most of the children were positive or neutral about older people. Girls were slightly more positive than boys. Kids aged 7 to 9 were the most prejudiced, and 10- to 12-year-olds the least. That reflects what’s been found in studies of discrimination based on ethnicity or gender, according to the researchers. Ageism resurfaced some, the study found, in early teens — those aged 13 to 16. Also, kids whose grandparents were in poorer health were more biased against older people than were those with healthy grandparents. “For many children, grandparents are their first and most frequent contact with older adults,” said study co-author Stephane Adam, a psychology professor at the University of Liege. “Our findings point to the potential of grandparents to be part of intergenerational programs designed to prevent ageism. “Next, we hope to explore what makes contacts with grandparents more rewarding for their grandchildren, as well as the effects on children of living with or caring for their grandparents,” Adam added. The study was published online recently in the journal Child Development.